I must really love my middle daughter, Mel. She has the ability to charm, cajole or just plain nag me into knitting for her. Last year I made her lots of accessories (hats and a cowl) before her giant European adventure. The piece de resistance was a co-designed and created cabled masterpiece: Cables of Europe. 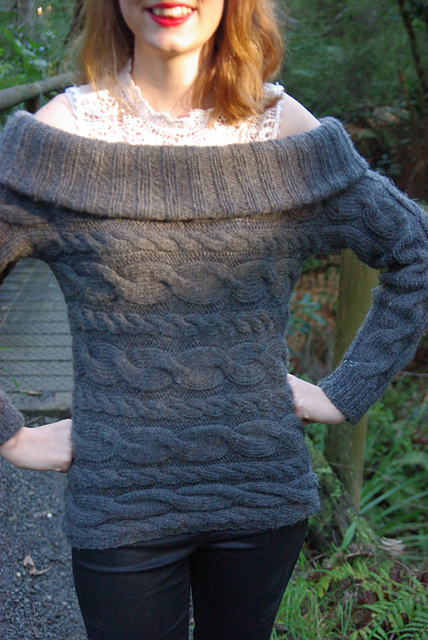 (She has promised a guest post on the knitwear tour of Europe very soon). I do know what it is about Mel's level of persuasion; she appeals to my vanity. It's secretly very flattering that she thinks my knitting skills are up to her exacting fashion standards. This is the ultimate compliment for a knitting mummy - when your adult children want you to knit garments for them. Mel likes to set me a knitting challenge to or an interesting puzzle to knit. 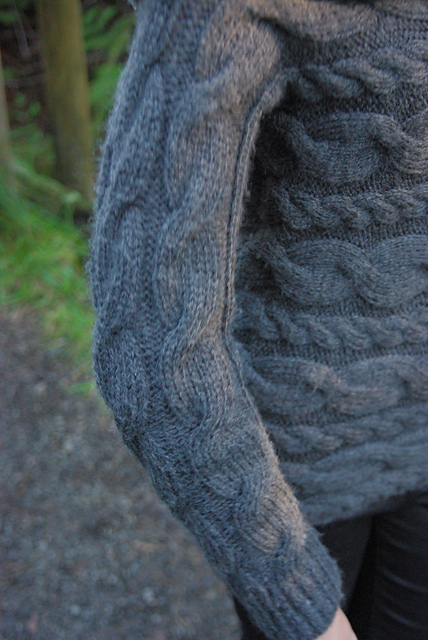 So when we found this Lion Brand Sideways Cable Pullover I was happy to knit it for her. However, the bobbles had to go! Bobbles are one of those knitting elements that knitters are bipolar about - we either love them or hate them. I'm firmly in the hate camp. Mel felt that were a design element that actually detracted from the overall fashionable quality of the jumper too. Bobbles are so 80s and not in a good way. I had to buy yarn for this as I had nothing bulky enough in the stash. The yarn we picked is light and a 65% acrylic, 35% wool blend in a gorgeous heathered dark gray. In some ways this was a really easy and gratifying project. But I also found it a hard slog. This is at the edge of my comfort zone in terms of wool weight and yarn size. I don’t like large needles and thick yarn. The straights I used for the sleeves and the front / back are plastic and the flow of yarn over needles was a little sticky. 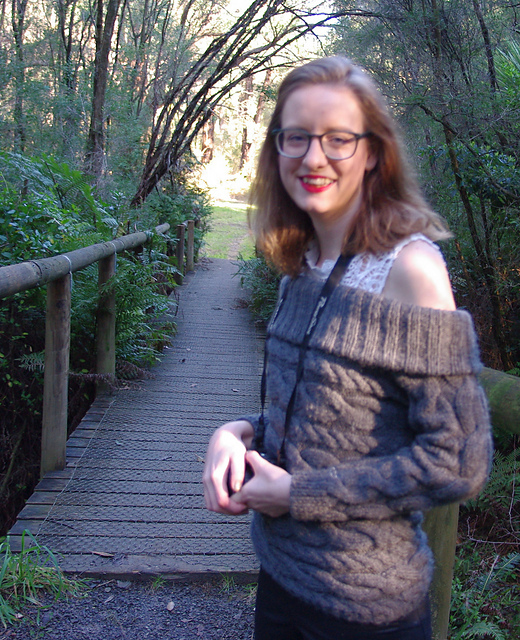 The concentration required for making this symmetrical length wise across the garment with three different cable patterns of different repeat lengths meant it didn’t make good television knitting. There was also the running modification of removing bobbles as I went. It also became too big too quickly to be easily portable knitting. It’s a serious lap full. 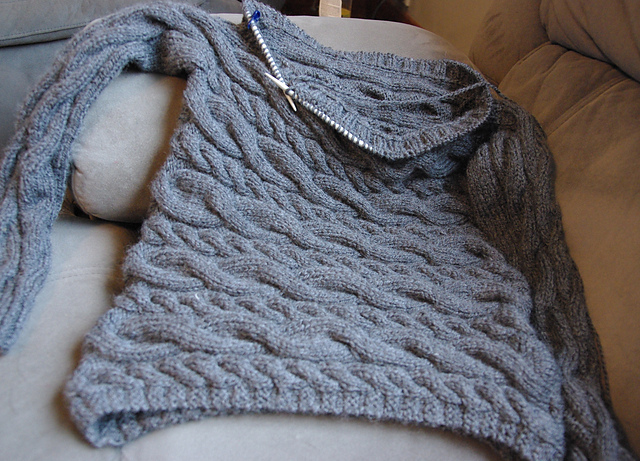 I completed the sideways single section that is the sleeves and body and got the cables to flow nicely from one side to the other and across the sleeves. It was seamed and the stitches picked up for the neck. (It did take me three goes and some intense mathematics to do this to get the right number of stitches with even spacing across the neck). 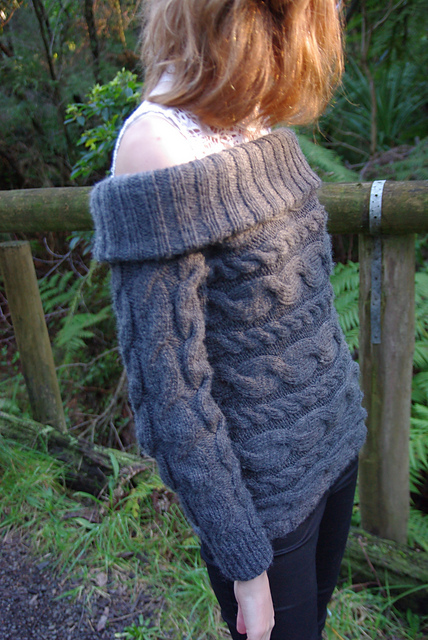 The two by two rib on the neck was nice mindless knitting. But the neck was very long before being folded double and seamed. This jumper has been a yardstick of my love for Mel. Every time she has seen me being unfaithful with another project she has mournfully turned puppy dog eyes on me and sadly proclaimed "You don't love me anymore. You're not knitting my jumper". I'd make sure I pointed out when I was actually knitting her jumper. See Mel, I really do love you. 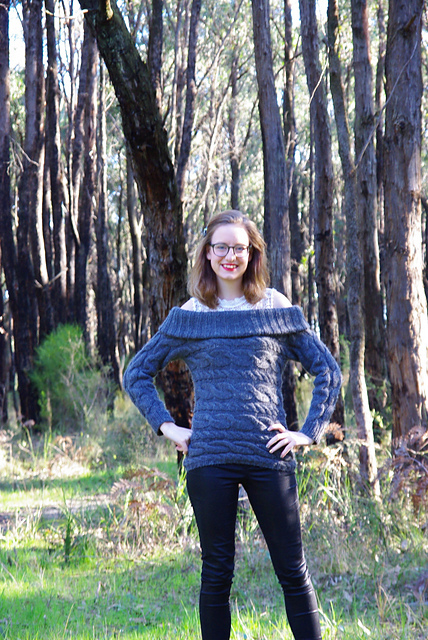 I finished your jumper! 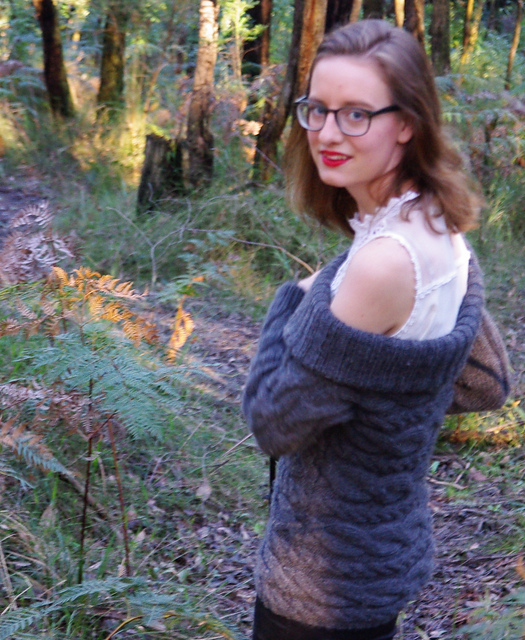 (Thanks to Mel and the boy for the knitwear modelling photos in some authentic Aussie bush).